They'll be no frights this Bite Night! You’re in safe hands this Halloween with 42nd Street® Chicken Fillet Bites! There’s nothing scary about 42nd Street® Chicken Fillet Bites, which combine only 100% whole muscle chicken breast with a specially developed coating that adds to the great flavour and succulent crispy texture that we all love. And it’s for this reason that we are celebrating the fantastic 42nd Street® fillet bite with its very own Halloween bite night! Running from 1st September until 31st October 2018, every purchase of 42nd Street® Chicken Fillet Bites will automatically enter your shop into this exclusive Q Partnership competition, with every unit purchased giving an additional entry. 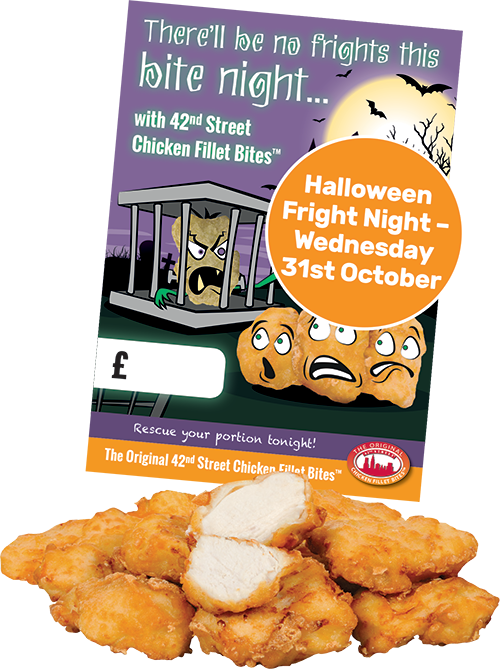 The final nail in the coffin to confirm entry is to send in your ‘scariest’ photo with a portion of 42nd Street® Chicken Fillet Bites and your Bite Night point of sale, all of which will be shared on Halloween itself! All details of entry will be sent out in the Point of Sale packs to qualifying shops**. Winners will be announced during the 1st week of November. If you don’t already sell 42nd Street® Chicken Fillet Bites then this is a great opportunity to add something extra to your menu, whether it be lunchtime specials, kids’ meals or even as a spooky side dish! *‘Height’ will be worked out from the 42nd Street® Chicken Fillet Bite packaging artwork height against the owner or manager’s height, check your supplier’s Terms and Conditions for more information. **To qualify, you must buy 42nd Street® Chicken Fillets Bites from any Q Partnership company (Friars Pride, Henry Colbeck, VA Whitley). If you have bought 42nd Street® Chicken Fillets Bites during July and August you will automatically receive your pack during September, otherwise you will be able to request your pack when purchasingduring September and October. Terms and conditions apply. Purchase necessary. Subject to purchase of 42nd Street Chicken Fillet Bites. To confirm entry shops must send their ‘scariest’ photo with the 42ndStreet ‘Bite Night’ point of sale and a portion of 42nd Street chicken fillet bites to enquiries@vawhitley.co.uk with the subject line ‘42nd Street Bite Night’. The email must containcontact name, shop name, contact telephone number and postcode. Shops must also share on social media where applicable. Every bag purchased between 1st September 2018 and 31st October 2018 will automatically count as one entry into the prize draw. The number of entries are unlimited, per participating shop. One prize per Q Partnership member. Maximum prize height up to 6.2ft /189cm. Winning prize must be delivered over 1 to 2 deliveries. While promotional stocks last. Entrants must be over 18 years of age. The promoter is The Q Partnership and no employees or family members of the partnership companies are entitled to enter. There is no cash alternative and the prize is non-transferable. Entrants’ photos will be used as part of the ‘Bite Night’ social media campaign and may be used for publicity purposes. Winners will be selected at random and notified by phone. Winners maybe required to take part in publicity. The promotion runs from 1st September 2018 to 31st October 2018 inclusive. ‘Height’ refers to the 42ndStreet® Chicken Fillet Bite packaging artwork height (480mm) against the owner or manager’s height, to the maximum of 6.2ft/189cm. Owner/manager heights will be rounded up to the nearest applicable bag height. Winners will be informed w/c 5th November 2018.